In recent years, a large aftermarket has emerged for medical devices and equipment that have been restored to safety and efficacy. The equipment is refurbished through a process of repairing worn and broken parts or replacing them with original parts, and updating software and electronics. Because no product specifications are altered during the refurbishment process, as for remanufactured products, refurbished products may be sold worldwide without obtaining special approvals. This has created a burgeoning international market in medical equipment and devices, distinct from the market in used—and unrestored—products, and remanufactured products. The market is expanding at an annual rate of almost 8% annually. By 2017, annual sales of refurbished medical equipment are expected to reach almost $8.5 billion worldwide. Both OEM producers of medical devices and equipment and third party vendors are active in the market. Refurbished equipment is widely used in both developed countries and emerging economies, driven by pressure to contain healthcare costs and environmental concerns. 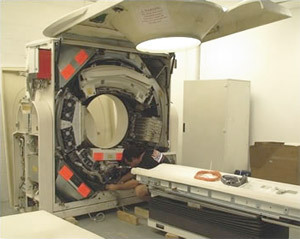 An estimated one third of CT scanners in the US are refurbished. The refurbishing process generally starts with inspection and de-installation at the site of the original equipment owner. The condition of the equipment is assessed and its performance history is reviewed. If the equipment meets the refurbishing company’s criteria, and if spare parts are available (and will remain available for at least a few more years), the equipment is de-installed by qualified technicians and shipped to a factory, in the case of OEM refurbishers, or to an engineering workshop. At the factory or workshop, the equipment is fully disassembled, cleaned and disinfected. Parts are painted or their finishes are otherwise restored. All components are checked for wear and operability, and worn or nonfunctioning elements are replaced with original parts. All software and systems are updated. In many cases, systems will be customized to meet customer requirements. Finally, the equipment undergoes testing to ensure that it performs safely and accurately. Once the restoration process is complete, the equipment is shipped to the purchaser’s site and installed. It undergoes an on-site testing process and, when necessary, safety certification. Some vendors provide training in the use of the new system. In most cases, refurbished equipment is sold under warranty and with a service contract. An extremely wide range of medical equipment and devices are sold as refurbished, including diagnostic and imaging equipment, surgical equipment, monitoring devices and biotechnology instruments.